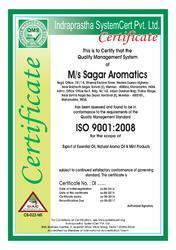 Incepted in the year 2000, Sagar Aromatics is one of the reputed manufacturers and suppliers of Perfumery, Ayurvedic, Cosmetic and Personal Care Product. We are also a merchant trader of Natural Essential Oil, Mentha Products, Aroma Chemicals and other natural products. Our range is widely appreciated for purity, accurate composition, wonderful fragrances and high effectiveness. Our company has gained immense market growth & good reputation amongst our global clients on the lines of qualitative production. We possess state-of-the-art machines, which are operated by our expert professionals, who work with full dedication & keeps the clients satisfied by providing them effective range of Perfumery, Ayurvedic, Cosmetic and Personal Care Product. Along with the in-depth knowledge of our professionals, we have also gathered tremendous experience in the industry & this has added to the refinement & enrichment of our product quality & variety. Our quality analysts stringently test the entire range on certain parameters like efficacy, composition, skin friendly to ensure defined industrial standard in our product range. Under the able guidance of our Mentor, Mr. Praveen Ghoghari, we have earned a respectable position in the domain. His transparent business dealings and deep knowledge has helped us in gaining a vast clientele across the globe. Trading, Importer and Exporter of Herbal Products. Our professionals have acquired tremendous knowledge in their respective domain. Their untiring efforts and in-depth experience has helped us in meeting clients requirement and maintaining trust. We have a team of experienced doctors, botanists and consultants that work in close association and with similar objective to offer natural herbal solutions. Our eminent botanist selects finest herbs for preparing effective range of Perfumery, Ayurvedic, Cosmetic and Personal Care Product. Our quality analysts stringently test the entire range to ensure to ensure quality standard.